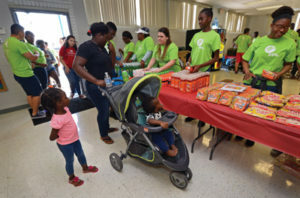 Florida Power & Light Company (FPL) volunteers distribute food to 150 food insecure families at the Highlands Village Community Center, an organization served by Joshua’s Heart Foundation (JHF), as part of FPL’s Power to Care initiative on March 9, 2019 in North Miami Beach. JHF is a local nonprofit that provides families in need with food, toys, books and other personal items as part of its mission to fight hunger in local communities and abroad. 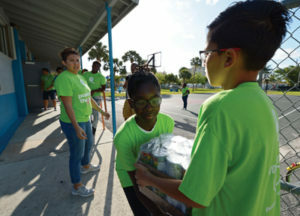 Celebrating its 11th anniversary, FPL’s Power to Care Week consisted of 30 projects with more than 1,000 employee volunteers throughout the state. Photo credit: David Adame for FPL. Beginning March 4, Florida Power & Light Company (FPL) volunteers will participate in FPL’s Power to Care Week. Throughout the week, volunteers will roll up their sleeves to help make the communities they serve even better places to work and raise families. 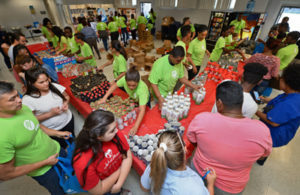 On Saturday, March 9, more than 45 FPL volunteers will have all hands-on deck packing a weeklong supply of meals for 150 food insecure families at the Highlands Village Community Center in North Miami Beach, an organization served by Joshua’s Heart Foundation (JHF). JHF, a local nonprofit, is dedicated to fighting hunger in local communities and abroad. Since its inception in 2005, the organization has raised over $1M to execute its mission to stomp out hunger, distributed over 2.2 million pounds of food, served over 500K meals to families, assisted over 450K individuals, recruited over 25K youth volunteers and donated over 100K toys, books and personal items. “These volunteer efforts will benefit North Miami Beach residents and JHF is honored to be a part FPL’s Power to Care Week,” said JHF local chapter president, Colin Walness. 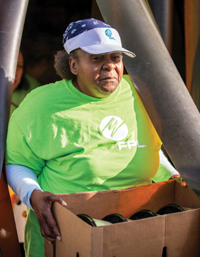 Florida Power & Light Company (FPL) employee Lucretia Allen carries packaged food to load a van for distribution to food insecure residents at the Highlands Village Community Center. Photo credit: David Adame for FPL. North Miami Beach Mayor DiFillipo and various commissioners worked to identify families for support. Tennessee Titans safety and Miami native Johnathan Cyprien will also be in attendance. This is one of 27 volunteer projects that are part of Power to Care Week, now in its 11th year. During the week, FPL volunteers will tackle community projects in 11 counties throughout Florida.